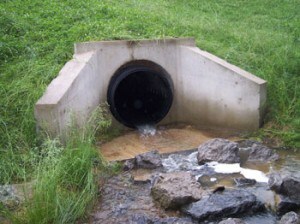 A culvert is a device used to channel water. It may be used to allow water to pass underneath a road, railway, or embankment. Culverts come in many shapes and sizes, including round, elliptical, flat-bottomed, pear shaped and box. They vary from the small drainage culverts found on highways and driveways to large diameter structures on significant waterways or supporting large water control works. The latter can comprise large engineering projects. There are three primary materials that culverts are made out of: steel, pre-cast concrete and polyvinyl chloride (PVC) (plastic). They can also be built as a hybrid between steel and concrete, for example an open-bottom corrugated steel structure on concrete footings, or a corrugated steel structure with a concrete “collar” around the ends. The construction of stone culverts was common in the past. 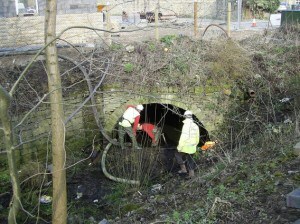 The clear-running of these culvert channels, up to 4 sqm in section, is vital in helping to reduce the chances of flooding. This is where Airload Environmental come in, we have undertaken many clearance projects, removing silt and debris from sand and sludge to traffic cones, shopping trolleys, even the odd antique vase. 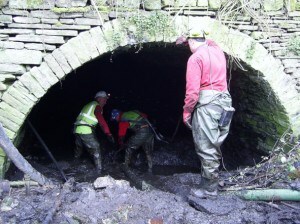 We have the machinery and the skilled operators to clear blockages and jet wash most culverts, drains and sewers.